Around noon tomorrow, a 53-foot equipment truck will pull out of Citizens Bank Park and begin an eight-state, 1,058-mile trek to Clearwater, Fla. The Phillies will hold their first workout of the 2016 season a week from today, on Feb. 18, and they’ll need the 2,400 baseballs, 1,200 bats, 140 helmets, 75 assorted baseball shoes, 600 hats and one Phanatic hot dog launcher that are among the items packed onto that truck. OK, they won’t need the hot dog launcher. But we know someone who will. A couple dozen of those 2,400 baseballs will pop into mitts next week, providing the soundtrack of the start of spring training. The Phillies pitching staff has undergone a facelift in the last year. Cole Hamels, Cliff Lee and Jonathan Papelbon, who all threw pitches in the ‘pens at the Carpenter Complex a year ago, are gone. Ken Giles, Jake Diekman and Justin DeFratus are ex-Phillies, too. The longest-tenured pitcher on the Phillies roster is Luis Garcia. When the starting rotation is assembled for Opening Day, there’s a very good chance Aaron Nola will have made the most career starts in a Phillies uniform than anyone else in the staff. Let’s take a look at the top storylines and position battles among Phillies pitchers this spring. Since the beginning of the 2008 season, the Phillies have had a grand total of four pitchers rack up more than five saves in a single season: Brad Lidge, Ryan Madson, Jonathan Papelbon and Ken Giles. Call it consistency or reliability (or, perhaps, allotting a lot of payroll into the position) but there haven't been many questions about who would be taking the ball in the ninth inning for the Phillies in the last eight seasons (and for a while before then, when Brett Myers, Tom Gordon, Billy Wagner and Jose Mesa closed out games). Let’s get this out of the way before we go any further: the identity of the closer on a team that’s expected to flirt with last place and 95-100 losses is similar to the identity of the leadoff hitter or the top pinch-hitter off the bench. Translation: it’s not that important. But it surely is important to the players, who can either re-establish themselves as effective closers in the big leagues or pull a Giles and immediately show off an arm that deserves a look in the coveted bullpen role. Since there is no shortage of options for the Phillies management and coaching staff this spring, the battle for the closer’s role might be the best competition of the spring in Clearwater. The favorite heading into camp is David Hernandez. The 30-year-old righthander is the only newcomer who was signed to a major-league free agent contract this winter: he penned his name to a one-year, $3.9 million deal. Hernandez went 11-for-11 in save chances for Arizona when J.J. Putz was on the DL in July of 2011. That’s his closing experience. But he followed the ’11 season with a very strong performance in 2012 — 2.50 ERA in 72 games, 98 strikeouts and 22 walks in 68 1/3 innings —and is nearly two years removed from Tommy John surgery. Three other pitchers in camp have more big league closing experience but are coming into camp on minor league contracts as they try to reassert themselves as big leaguers, period. South Jersey native Andrew Bailey has pitched in just 10 major league games since 2013, when he won a ring with the world champion Boston Red Sox; fellow 31-year-old Edward Mujica racked up 37 saves for the NL champion St. Louis Cardinals in 2013 but struggled to find consistency last year with Boston and Oakland; Ernesto Frieri, 30, saved 60 games for the Los Angeles Angels in 2012 and 2013 but had a 6.35 ERA in 36 games with Pittsburgh and Tampa Bay in the last two seasons. Hernandez and that aforementioned trio (and even 30-year-old James Russell) give the Phillies more than a couple veteran options. But the guy who wins the job out of camp may not necessarily be the guy closing games in the middle of the summer. Among the prospects who could impress in Clearwater and jump into the big league ‘pen this summer, none is more intriguing than Jimmy Cordero and his 104-MPH fastball. Veterans Jeremy Hellickson and Charlie Morton were brought on to ease the burden on the young Phillies starters. Two of those young starters, Aaron Nola and Jerad Eickhoff, were all but handed rotation jobs by manager Pete Mackanin this winter (which isn’t surprising, given their respective performances late last summer). So who takes the fifth? Lefthander Adam Morgan held the opposition to three runs or fewer in 10 of his 15 starts as a rookie last season but has probably been passed by two of the four pitchers acquired in the Giles trade on the depth chart. Fellow lefty Brett Oberholtzer, a 26-year-old New Castle, Del., native, has a longer big league track record than Morgan while 23-year-old righthander Vincent Velasquez has a bigger arm than both, showcasing a mid-90s fastball with Houston last season. Since Oberholtzer is out of minor league options, the bet here is he wins the job with a decent showing this spring. Velasquez could easily go to Triple-A and continue to build his arm as a starter (12 of his 19 games with Houston last year came as a reliever). Morgan, Zach Eflin, Mark Appel and Jake Thompson would round out a pretty strong staff of starters waiting in the wings when an arm is needed. The fact that David Buchanan and Severino Gonzalez have gone from making a combined 22 big league starts in 2015 to being eyed as organizational depth guys in 2016 shows how much the Phillies have improved their pitching inventory in the last seven months. Since we already mentioned Cordero’s electric arm (the key for him will be throwing strikes consistency and commanding his secondary pitch), the next best young attractions are the new starters in camp, particularly Appel and Thompson. Thompson, 22, was rated the 43rd best prospect in baseball by Baseball America last February and was the best pitching prospect the Phillies received in the Cole Hamels trade. 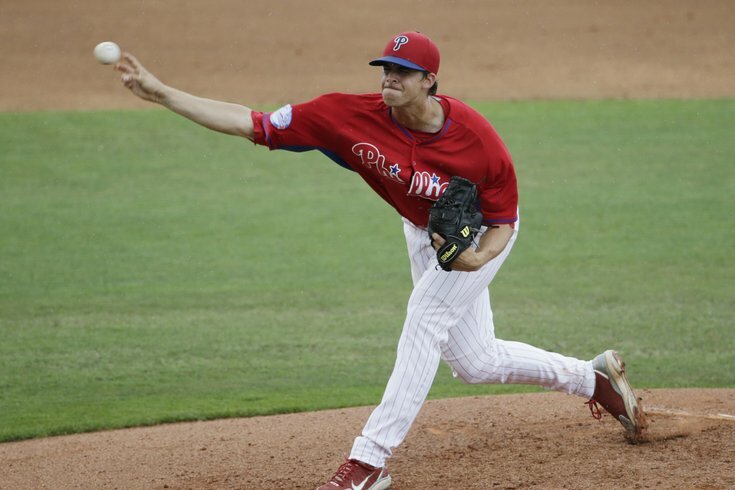 Since Eickhoff (also in the Hamels trade) made a strong first impression, that’s a good sign for Phillies fans. Thompson went 5-1 with a 1.80 ERA in seven starts at Double-A Reading after the trade. As with Appel, Thompson could have an opportunity to try out his stuff against big league hitters in Grapefruit League games next month. Meanwhile, down in minor league camp, reigning Paul Owens Award winner Ricardo Pinto, 22, could be a year behind those other two guys after splitting 2015 at Low-A Lakewood and Class A Clearwater, but he has the talent to rise quickly and onto the big league radar before long.